​Are you a rambler or a thrill seeker? We ventured out to Waterton last weekend to hike Crypt Lake, one of National Geographic’s top 20 world hikes for thrill seekers. Overview: Day hike in Waterton Lakes National Park. Moderately difficult due to technical aspects and exposure. If you are in to narrow cliff ledges, ladders, boat rides, tunnels, waterfalls and gorgeous alpine lakes (who isn’t? ), this one isn’t a stroll in the park, but it is also not a very arduous or difficult hike, with a pretty good pay-off. "Some hikes are peaceful rambles in the woods, and those are just fine for quiet contemplation. But the hikes that really open your eyes are the thrill rides. The following 20 walks take in perilous heights, erupting volcanoes, treacherous steps, and other hair-raising moments. They range from what are essentially low-level rock climbs to strolls on narrow ridges—and they are all guaranteed to up your heart rate." Crypt Lake feels like an adventure more than a hike. It is a busy trail, so if you are looking for serenity in nature, there are lots of other options in Waterton. However, if you are looking for a fun, quick adventure and thrill without a lot of pain, we really thought this delivered. The crew on the boat over to the hike told us this hike was rated moderate to difficult, however after completion, we imagine this is only due to the few technical bits, and perhaps to overall length of about 17km return trip. ​​Pros: We liked the variety of the terrain from sections with tree cover and a steep start, to blazing hot exposure with long mountain vistas, some technical terrain, and lots to look at with 4 major waterfalls. And of course, the grand finale at Crypt Lake itself. Cons: Busy. You need to start and end your hikes according to the boat pick up and drop off times and this means you are also then hiking close to a glob of about 100 people you boated over with (note from the editor: I found if you take the later boat, rather than the boat first thing in the morning, you end up with less people). Usually this wouldn’t sell me. 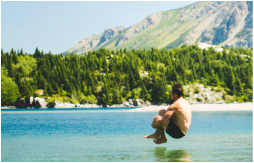 Tip 1: We recommend taking the walk around the lake (and as a matter of fact, across an international border into Montana) to find a quiet lunch spot or swimming hole. The majority of hikers stayed at the start of the lake but the further reaches provided better opportunities for photos in mid-afternoon and some access to some cool, quiet places to lunch. Tip 2: Bring LOTS of water. With the extreme exposure for the last half of the ascent and first half of the descent, and given the distance, we recommend a minimum of 2 litres each. We pushed our luck with 3 litres and brought a water filtration system but got lazy before we descended and didn’t filter more water. We were parched and thirsty and miserable for the last half of the descent. We filtered and immediately drank an additional 1.5 litres by the lake at the trail head while we waited for our return boat. ​Tip 3: Plan your trip times well and show up early to the ticket office to buy your tickets. We took the first boat out at 8:30 and gave ourselves six hours to complete the trip and return on the 4pm boat. It took us 2.5 hours to ascend, and 2 hours to descend, and we had a leisurely lunch and plenty of time to stroll around the lake. The last boat leaves at 5:30 and there is no other way out but to walk the extra 12 km if you miss the last boat. See My Waterton’s trail info. Parks Canada 2016 trail report.